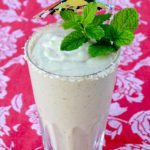 This Creamy Vegan Pawpaw Smoothie is rich, tropical and features a rare fruit that is native to North America. A fruit so special it was once a popular treat served by American presidents! 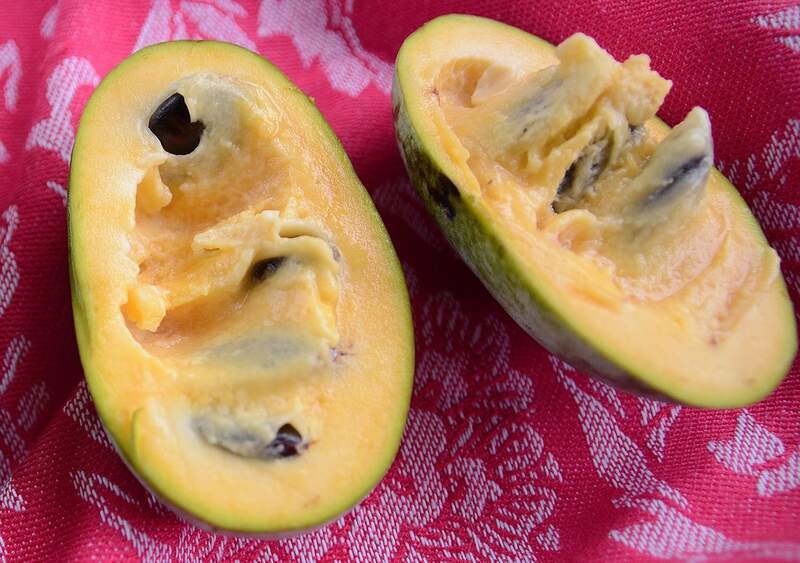 If you’ve never heard of a pawpaw, you aren’t alone! 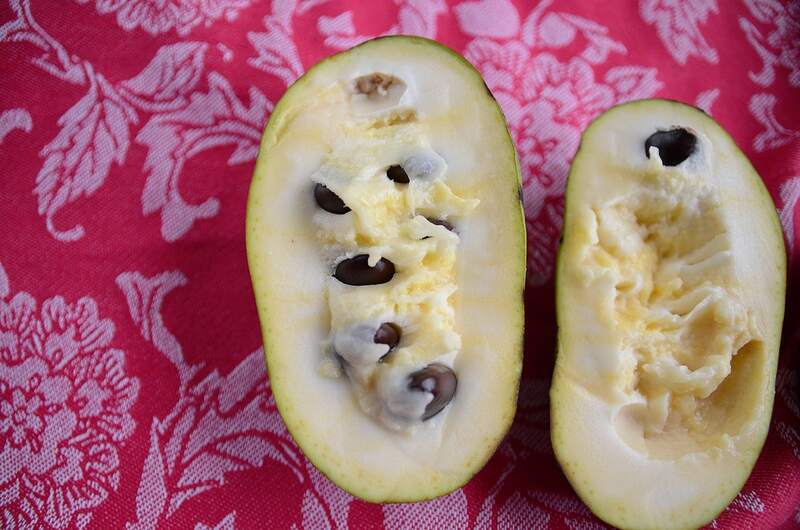 But even if you have, I hope today’s post will get you excited to eat pawpaws! 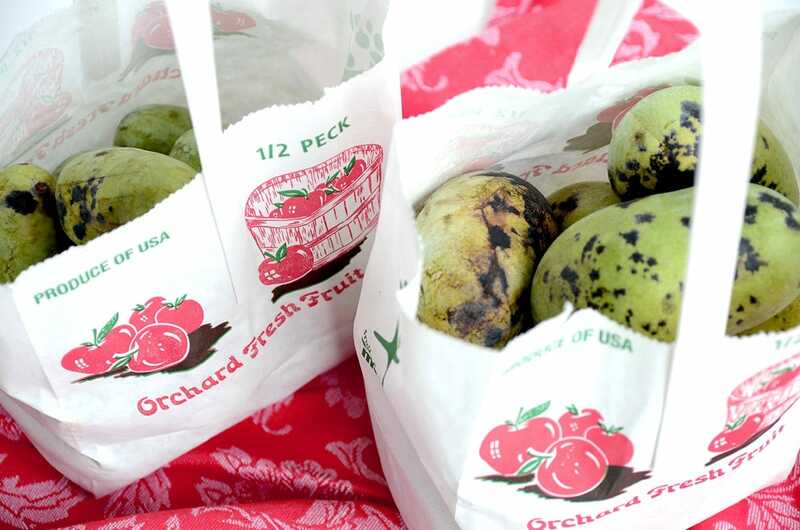 Once a favorite of Colonial and Native Americans, the custardy pawpaw has fallen out of favor due to its lack of commercial viability but can still be found in the wild and at select orchards. Despite the fact that few pollinators are attracted to the flower’s scent, pawpaws are the largest indigenous fruit native to North America, where they are grown in at least 25 US states and Ontario. Known by many names, West Virginia banana, Hoosier banana, poor man’s banana and banango, Asimina Triloba is actually a distant relative of the Cherimoya and the only member of the tropical Annonaceae family that grows in temperate climate. So why has this not so tropical, exotic tasting fruit once favored by George Washington and Thomas Jefferson all but disappeared from the American lexicon? Pawpaws must tree ripen and once picked, they are similar to an overripe banana, and must be consumed quickly. Although this makes them impractical for shipping and the larger commercial market, there are numerous nurseries selling pawpaw trees throughout the US. The fruits are tasty but pawpaw trees are an also an excellent choice for home landscaping as they are naturally pest resistant and low maintenance, so I am hopeful that they will make a long overdue comeback. Pawpaw, also spelled papaw, should not be confused with papaya which can also be called a paw paw. Confused yet? Don’t be. When you come across this prairie banana you will know it by its green spotted flesh. We happened upon such fruit in early August while hiking in a nature preserve. I grabbed a few despite the fact they weren’t quite in season yet and took the fruits home to ripen on the counter. Lesson learned, I should have foraged about a month later, as they tasted like saccharin SweeTarts once soft. 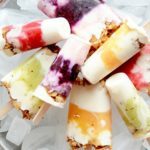 So now that we are well into pawpaw season, I looked on pickyourown.org to find a local source. Luckily, I found a farm nearby carries them. So our pawpaw adventure started with the Downtown Berryville Yard Sales I told you about last week. The event was held, rather unsuccessfully, in a downpour of biblical proportions BUT we persevered and found a couple items despite the weather. So, treasures in hand and soaking wet, we headed to Mackintosh Fruit Farm where we ended up buying two varieties of pawpaws. In total, we purchased 8 pounds of rare expensive ($5 a pound) fruit to experiment with. 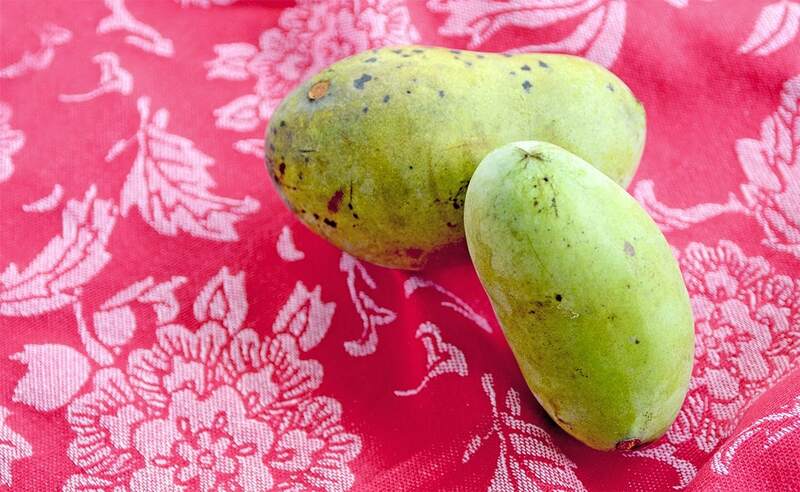 The flavor profile of a pawpaw is a cross between a mango and a banana with notes of vanilla, apple and citrus. From the two varieties we sampled, we found the Shenandoah to be mild in flavor while the Allegheny was more pungent and rich. Both were nice, but we preferred the Shenandoah’s mild creaminess. I started my recipe testing by making a pie, but was unhappy with the results. I am not fond of bananas, which honestly might be the understatement of the year, and something about the cooking process made the pawpaw flavor more banana-y than they were raw, so despite Kevin thinking the pies were good, in the trash they went. However, this smoothie experiment was a winner. I combined the tropical pawpaw flavors with coconut milk and vanilla and added in some almonds for protein. Its also a great use of pawpaws because they have a short shelf life. But pawpaw flesh can be frozen! So now is the time for you to hunt down this rare fruit, whether at a local fruit farm or found in nature, this piece of Americana deserves a spot on your culinary bucket list! Do you have a pawpaw source? If so, let us know by commenting below. Thanks for sharing! 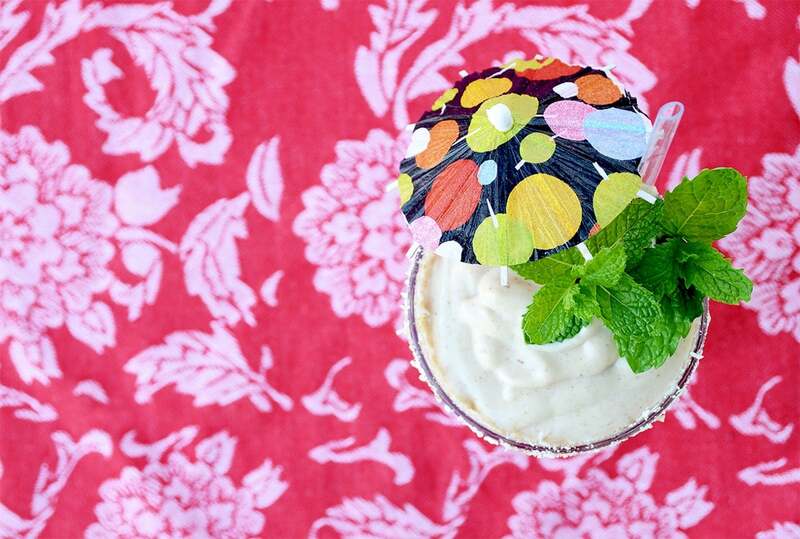 This recipe uses the rare American pawpaw. They are in season in the fall and can be foraged or found at specialty orchards. 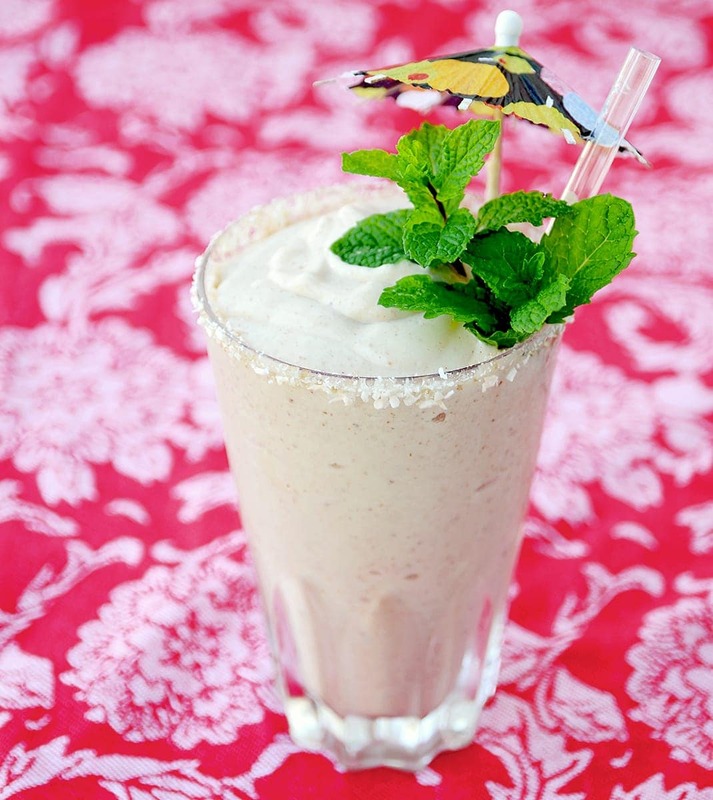 If you can't find pawpaws, substitute half banana and half mango in this recipe. Scoop out pawpaw flesh and freeze it. 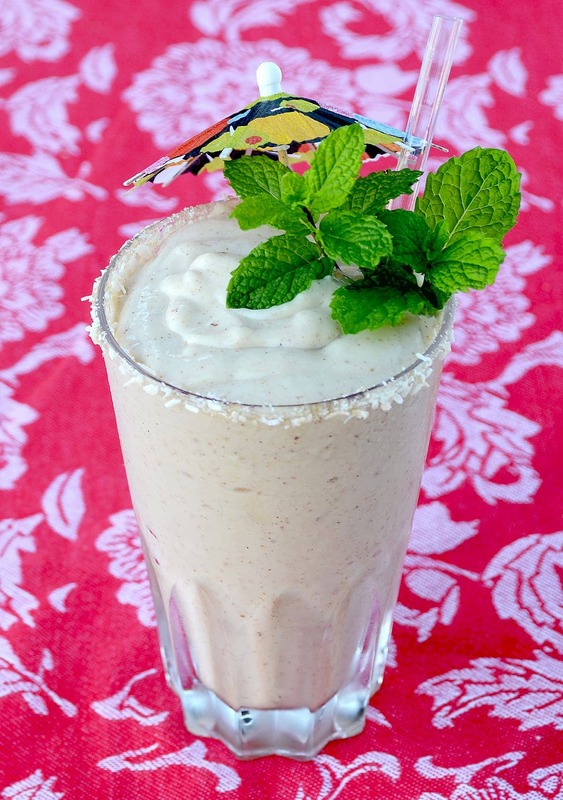 In a blender combine frozen pawpaw, almonds, vanilla extract, coconut milk, agave, ice and water. 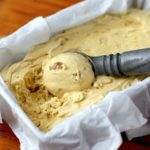 This delectable ice cream scratches all your sinful itches. It’s creamy, crunchy, salty, sweet with a hint of banana mango flavor from exotic pawpaw fruit. 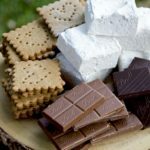 Made from scratch with artisan hickory syrup and whiskey, fine chocolate has met it’s match with these fluffy confections.